It is very seldom that I post a photo that is not my own, but this one has to be an exception. 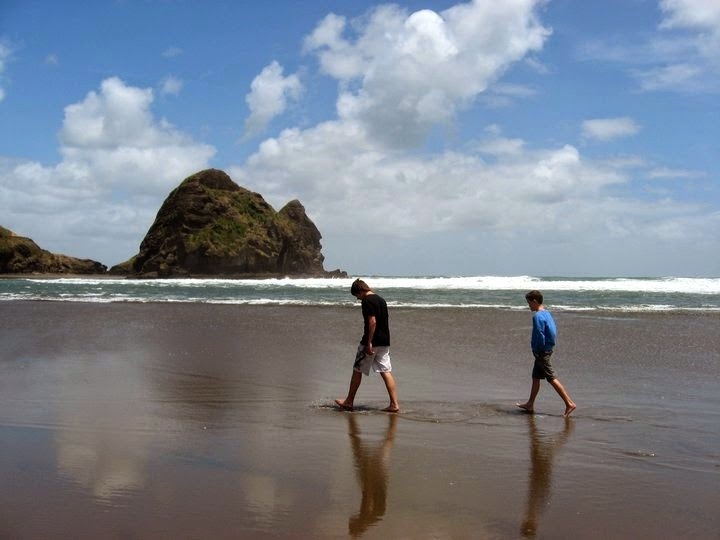 This is from my friend Martin Wiltshire and is of him and his brother on Piha Beach in New Zealand. The colors and reflections are just amazing. Thanks Martin. Well you borrowed a great photo this week. I love wet beach sand reflections. Evocatively beautiful - I'd like to paint that. Really nice image. Not only is it sharp, colorful, and well composed, it tells the story of a stroll on the beach. Yes, you borrowed a very nice photo. What a terrific capture of an incredibly beautiful place! Wow! Took my breath away! Thanks for sharing! Enjoy your weekend!! That photo makes me smile!! Thank you for posting this, Bill! I appreciate this very much.